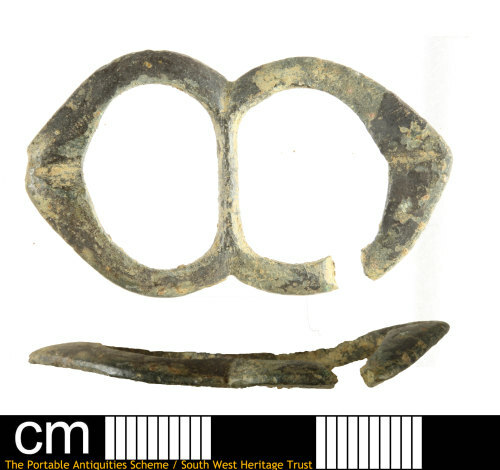 A post-medieval copper alloy double loop buckle dating to cAD1500 - AD1650. The loops are both oval in shape and with the outer edge extended into a point with a transverse notch for the pin, one is slightly chipped at the point. The pin is missing. There is a patinated break through one loop but it is only slightly distorted. The buckle has a shiny brown patina, especially on the convex front but is plain on the flat back. It measures 39.81mm in length, 22.88mm in width, 2.69mm in thickness and weighs 4.72g. A similar example can be found in Whitehead (2003:55) no.315 which he suggests dates to c.1500-1650 AD.